The Qajar dynasty, which ruled Persia from 1794 to 1925, was not a direct continuation of the Safavid period. The invasion of the Ghilzai Afghan tribes with the occupation in 1722 of the Safavid capital Isfahan, and the eventual collapse of the Safavid Empire in the following decade plunged Iran into a period of political chaos. With the exception of the Zand interval (1750-79), the history of 18th century Iran was marred by tribal violence. This ended with the coronation of Aqa Muhammad Khan Qajar in 1796, which ushered in a period of political stability that was characterised by a revival of cultural and artistic life. The Zand and Qajar periods saw a continuation of oil painting introduced in the 17th century, and the decoration of lacquer boxes and book-bindings. Illustrated historical manuscripts and single page portraits were also produced for a range of patrons, in a style consistent with that of Muhammad Ali (son of Muhammad Zaman) and his contemporaries. While the excessive use of shading sometimes endows these works with a dusky quality, they do display an improved understanding of the play of light (coming from a single source) on three-dimensional forms. The evolution of Persian art in the 18th and 19th centuries can be divided into distinct phases, beginning with the reign of Karim Khan Zand (1750-79), Fath Ali Shah (1797-1834) and Nasir ad-Din Shah(1848-96). During the Zand period, Shiraz became not only the capital but also the centre of artistic excellence in Iran, and Karim Khan's building program in the city attempted to emulate Shah Abbas' Isfahan. Shiraz was endowed with fortifications, palaces, mosques and other civil amenities. 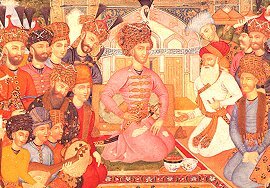 Karim Khan was also a noted patron to painting, and the Safavid-European tradition of monumental figure painting was revived under the Zand dynasty, as part of an overall revival of the arts. Zand artists were as versatile as their predecessors. As well as developing life-sized paintings (murals and oils on canvas), manuscripts, illustrations, watercolours, lacquer work, and enamels from the Saffavid dynasty, they added a new medium that of wash drawing. However, in their paintings, the results often appeared to be rigid, since the Zand artists in order to correct what they considered an excessive emphasis on three-dimensionality, attempted to lighten the composition by the introduction of decorative elements. Sometimes pearls and various jewels were painted on the headgear and clothing of the subjects. Shah Abbas II receiving a Mughal ambassador. Historical painting by 18th century Zand artist Abu'l Hasan Ghaffari Mustawfi Kashani. Notice the use of decorative elements in this painting. Karim Khan, who preferred the title Regent (Vakil) to that of Shah, did not demand that his painters prettify his appearance; he was happy to be shown at an informal and unpretentious gathering in a modest architectural setting. The tone of these Zand paintings contrast sharply with the later images of Fath Ali Shah (the second of the seven rulers of the Qajar dynasty) and his court. There is an unquestionable Zand inheritance in early Qajar art. 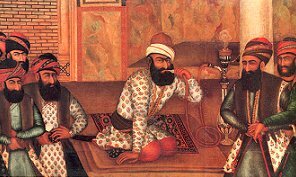 It is known that the founder of the Qajar dynasty, Aqa Muhammad Khan, decorated his Tehran audience hall with paintings looted from the Zand palace and Mirza Baba (one of Karim Khan's court artists) went on to become Fath 'Ali Shah's first painter-laureate.